Education Secretary Betsy DeVos Thursday used a visit by the federal school safety commission to a Maryland school to explore positive behavioral interventions and supports, a move some said failed her promise to highlight innovative school safety programs. Positive behavioral interventions and supports — which in Anne Arundel County, Maryland, schools, means a focus on relationship building among students, teachers, and staff — directly affects school safety, educators said. Students who feel more connected to a school and its community are less likely to harm it, Kathy Rockefeller, the district’s school climate specialist, told DeVos and other representatives of the commission. “Connection breeds safety,” she said. In a separate action Thursday, the Education Department awarded $1 million to help with the recovery at Santa Fe High School in Texas, where 10 people were killed earlier this month. The Maryland visit came as DeVos has faced criticism for conducting school safety commission business behind closed doors and failing to offer opportunities for public input. The department is also deciding whether to scrap an Obama-era guidance document that encouraged schools to adopt some of the very same positive behavioral supports and restorative discipline practices the commission examined Thursday. The guidance focused in particular on reducing suspensions and expulsions for students of color. 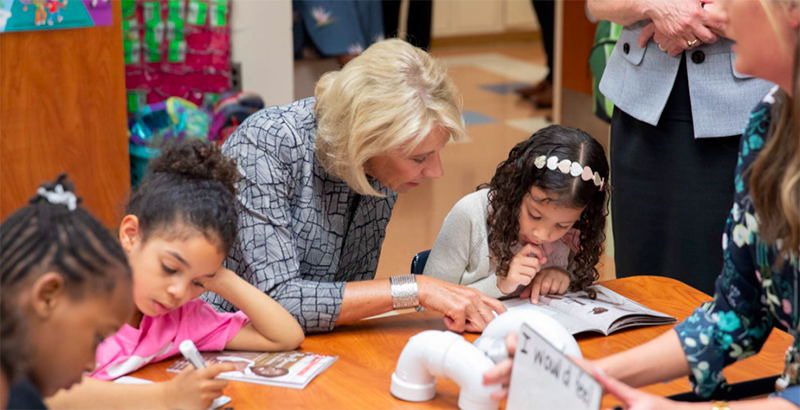 DeVos visited classrooms at Hebron-Harman Elementary School in Hanover, Maryland, and then held a roundtable discussion with district leaders, principals, teachers from Anne Arundel schools, and an expert in those interventions and supports. The secretaries of Health and Human Services and Homeland Security and the attorney general — also members of the commission — sent representatives to the meeting. Some advocates criticized DeVos for looking into a practice in use for decades after saying she’d focus on school practices that aren’t well known. “We’re concerned the secretary is just getting up to speed while the rest of the education community feels the urgency to act to implement practices we already know work. It’s a hazard of a chief education officer who is not in touch with what’s happening in schools,” JoAnn Bartoletti, executive director of the National Association of Secondary School Principals, said in a statement. Representatives of the Education Department did not immediately respond to a request for comment on the criticism. Positive behavioral supports and intervention broadly refers to a system of expectations and supports to encourage better behavior, particularly for traditionally disadvantaged students. It originated for students with disabilities, and is included as a recommended intervention in federal special education law, but has since expanded to cover all students. Should a shooting or other traumatic event happen, schools that have positive behavioral interventions in place can respond “more quickly and more strategically,” said George Sugai, co-director of the Center on Positive Behavioral Interventions and Supports, which receives funding from the Department of Education. The techniques can bolster other security efforts, Sugai told the commission. “Yes, you have to make sure that your [secure] doors and windows and your signaling systems are in place, and kids have to practice [safety drills], but you want to do it in the context of having this positive climate in place,” he added. In Anne Arundel, positive behavioral interventions, alongside restorative discipline practices, have saved a year and a half of instructional time for students who otherwise would have been suspended over the past five years, Kathy Lane, the district’s executive director of alternative education, told the panel. That drop in suspensions came even as the percentage of students who reported feeling safe at school increased, she said. Conservatives critics say the Obama-era guidance is forcing schools to keep potentially dangerous students in the classroom. DeVos in May told the House Education and the Workforce Committee that the commission should have recommendations by the end of the year but could produce an “interim report” before then. The commission will hold additional meetings, field visits, and listening sessions “in the coming weeks and months,” the Education Department said in a press release.